Congratulations parents! You have hit a new plateau in your life! It is time to sit back, sip a glass of wine, and thank your lucky stars you have kids aged 10-13. Although this age comes with a lot of challenges, it also comes with a shift in responsibility for you as the parent. It is time to figure out Chores for Kids Ages 10-13 and figure out how much sitting you can actually get away with. Not only are chores a great way to teach your kids how to survive in this world, but once they hit this lucky age, they can do just about anything which means you have more time to be you! Let them babysit. If you have younger ones, it may seem like you still have too much going on. Your kids are going to have to take care of another person at some point in their life, so why not start now. Keep in mind, state laws may regulate how old a child must be to babysit. In most states, 13 is allowed. It is also important to keep in mind the mental age of your child. Make their own lunch. You don’t have time to make everyone’s lunch and you shouldn’t have to. Kids can start doing this at 8. Laundry. By 10-13 years old, kids have already learned how to sort. So, now it’s time to put those skills to use in real life. 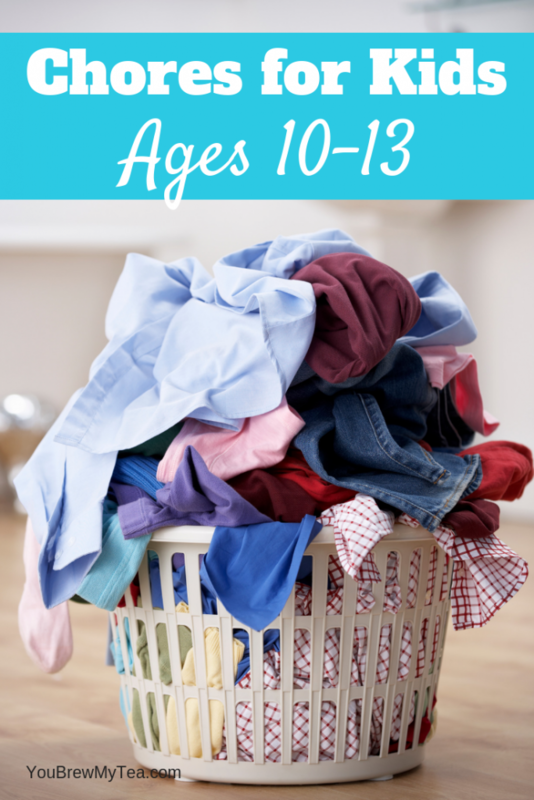 Have them do their own laundry including sorting, washing, and folding. Take out the garbage. As a mom, this is a never-ending chore, so delegate it to someone else. Kids are capable of taking out the garbage as well as picking up everything around the can that didn’t make it in. Hand over the mower. This is geared more towards 11 and 12-year-olds, but advanced 10-year-olds could do this as well. Teach them how to start it, where the blades are, and let them go (hint my 9-year-old does this). 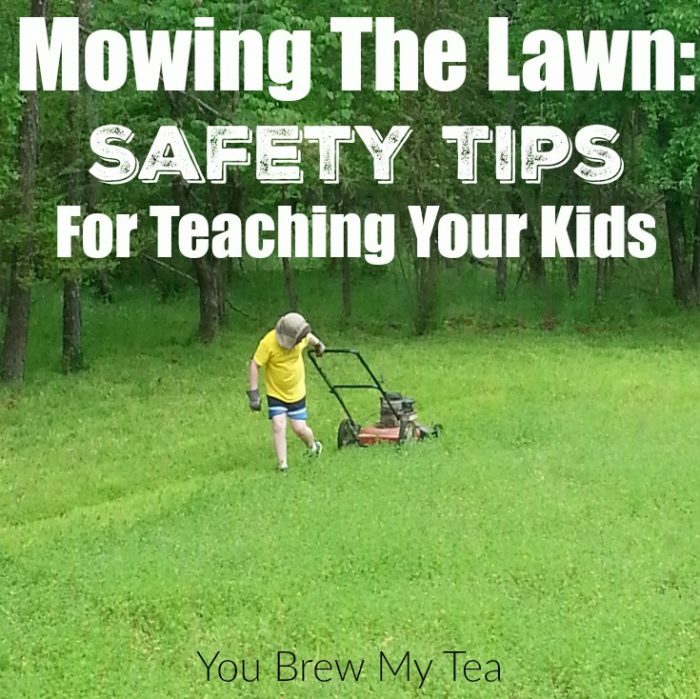 Here are some safety tips for teaching kids about mowing the lawn. Dishes. It is time for you to get that manicure you have been wanting because now that you have a 10-12-year-old, that chore can go to them. You may have to do a little teaching, but dishes are no longer your chore. Meal Preparation. Let’s face it; 10-12-year-olds aren’t going to be able to give you some gourmet dish, but they are capable of fending for themselves and helping cook simple things like hot dogs, mac & cheese, and ramen. Take a night off if you need to. Organize the recycling. If you are like my household, no one but me knows the concept of recycling. Now that your kids are between the ages of 10-12, it’s time to start teaching. Not only is this a great chore for them to do, but it is a great skill for them to have as they get older. We even have some tips here for teaching kids about recycling. Clean the toilet. I’m not going to lie, I save this chore for the boys. No offense gentlemen, but I am no longer cleaning the pee off the toilet seat, around the toilet seat, or off the floor when you can’t aim. Just a hint: Clorox wipes are great! 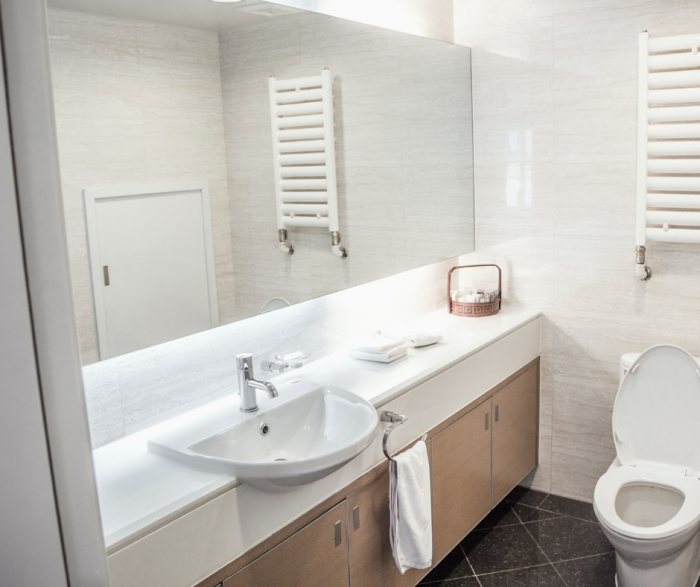 In our house, the men sit to use the bathroom! Wipe Counters. Although this is age appropriate for 10-12-year-olds, even little ones can get in on this chore with some Clorox wipes. Don’t forget to teach them to move things and clean under them as well. Rake the leaves. Honestly, if they can be out there with a powerful tool like a lawn mower, then they can rake up some grass and leaves. Not only is it a good chore for this age group, but they may still enjoy playing in the piles they have created. Take care of the pets. Kids can easily fill a dog dish or take a pet out for a walk. Make sure they know how important food, water, and love are. Our son feeds the cats and scoops the litter pans. You can even have them check out our post on how to save on pet supplies. Clean their own room. If you are still helping your kids clean their room, stop! At age 10-13, you should no longer have to delegate which drawer to put the underwear in. It is time for a little more independence. Wash the windows. It’s not like you ever get to this chore anyway, but seriously now you can. It is perfectly aged appropriately to have your 10-13-year-old wash windows. I like to use this as an extra chore for consequences. Help with groceries. 10-13-year-olds have legs, muscles, and arms, and they are perfectly capable of bringing in the groceries. In fact, they should since they will be the ones eating 99.9% of it. If you aren’t sure what is age appropriate for your 10-13-year-old, test it out. The more your kids know how to do while their younger, the easier adulting will be for them. Having the right chores for kids lined out for them to do as a way to learn responsibility and help you around the house is a must. Ashley is a work at home mother of 3. With a degree in education, Ashley is most proficient in educational pieces including special needs education. However, she enjoys writing about all things as learning is her passion. Her profound writing can be found at Matriarchs on a Mission.